King Size Bed Frames offer a variety of choice on style and comfort. 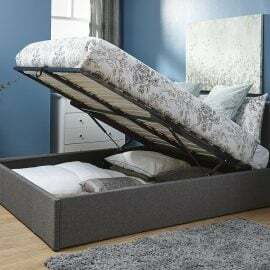 From divan to leather, fabric or wooden frames, we have a King Size bed frame to suit all tastes, requirements and budget. 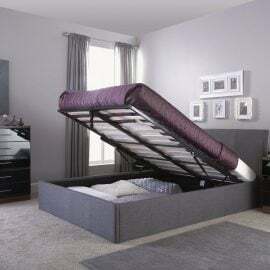 Buy a King Size bed frame from Bigmickey.ie and enjoy the perfect night’s sleep you’ve always dreamed of. The Alannah Fabric Bed Frame is finished in a royal blue velvet fabric. 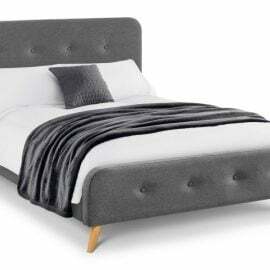 It features a rounded headboard and footend with button detailing. It’s sturdy block feet add a charming finishing touch. 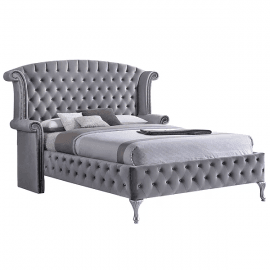 Our Alaska Black Leather Ottoman Bed Frame is available in luxurious fabric or faux leather finish. The base opens from the front and allows for plenty of storage inside with a non-woven base, it enables items which are stored away to be kept off the floor. The Alaska’s curved headboard is enhanced with a subtle stitched design that makes for a sophisticated look. 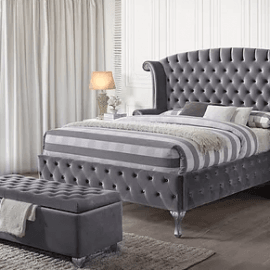 Our Alaska Grey Fabric Ottoman Bed Frame is available in luxurious fabric. The base opens from the front and allows for plenty of storage inside with a non-woven base, it enables items which are stored away to be kept off the floor. The Alaska’s curved headboard is enhanced with a subtle stitched design that makes for a sophisticated look. The Albania metal bed frame is an elegantly simple Victorian style frame. Available in black or Ivory this bed frame makes the perfect choice for the style conscious customer. The Albania features a sturdy metal construction and a sprung slatted base to ensure it provides an even and comfortable sleeping surface. The Alexa King Size Bed Frame is finished with a beautiful grey fabric material and boasts beautiful button detailing. 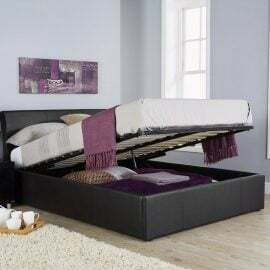 The Arizona Leather Ottoman Bed Frame Gas Lift Ottoman Bed Frame combines a striking style with exceptional storage space, look no further than our Arizona End Lift Ottoman bedstead. 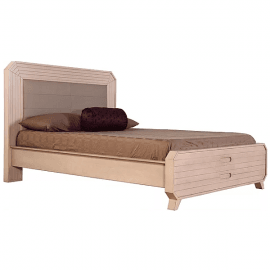 The Ashling Solid Wood King Size Bed is part of the Ashling Bedroom Collection. Crafted in a beautiful ash finish, it is strong and stylish and is suitable for any home. The Astrid Curved Retro Fabric Bed combines classic Scandinavian design with contemporary light oak splayed legs for a timeless style. 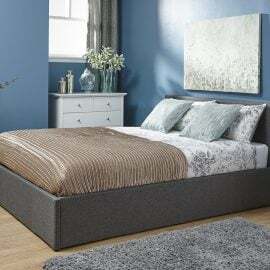 Beautifully upholseterd in a crisp grey linen with a neatly buttoned headboard, Astrid’s clean lines sit well with any contemporary decor and it is the perfect accompaniment to Julian Bowen’s stylish Alicia range of bedroom furniture range. The robust construction incorporates a sprung-slatted base to ensure a comfortable night’s sleep and prolonged mattress life.